With MIG welders you can weld a variety of metals, but they’re best used on thin metals such as aluminium. This is so because you need to have more control over the welding process as aluminium is rather sensitive when compared to other metals. MIG welding makes things harder to maneuver, like the feeding of the wire. This consequently resulted in the invention of this much-needed tool that enabled welders to have more control over the amount of wire they use and the overall quality of the weld finish. MIG welding is not very commonly used, which is why having experience with a similar technique is more than welcomed if you have decided to practice it. Otherwise, you’ll spend most of your time figuring out the different amperage settings and wire speeds. Nevertheless, before you get a spool gun for this purpose, you should learn how to properly use it. Before you start working with a spool gun, you will first need to adjust the wire speed and amperage to achieve enough penetration. A 115V welder is not powerful enough to melt through the metal in order to make the fusion, so that’s why you should get a 230V MIG welder. You can use the chart that comes with your machine to check which voltage and wire speed settings will work best for your needs. 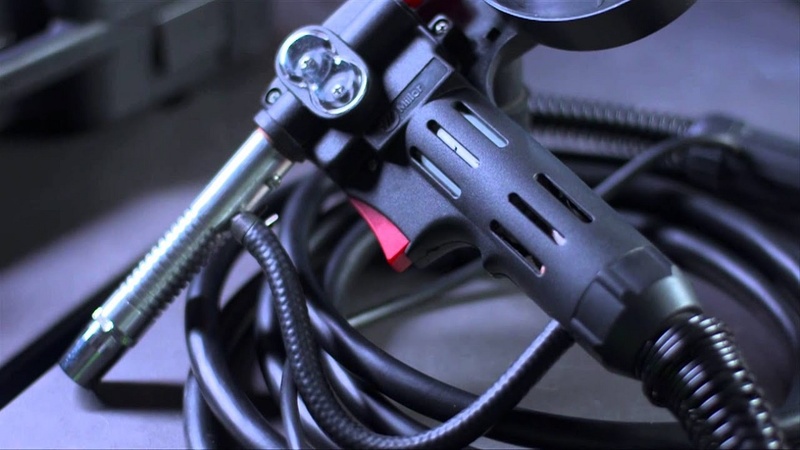 It is important to use a spool gun that will match the duty cycle of your welding machine, and you should also consider getting a torch and a hookup that will fit your existing MIG welder. The right spool gun is the one that will feed the aluminium wire best because they tend to bend quite easily and you don’t want to spend an entire day feeding out a wire out of your spool gun, just to save pennies on the dollar. Furthermore, you will need to adjust the flow of the shielding gas because too much of it will prevent you from having a steady arc. Too little of it, on the other hand, can make your arc start jumping around and hiss too much. If you want your weld to be neat and clean, preheat the aluminium before you start striking with the arc, especially if you happen to work in a colder climate. A basic understanding of MIG wires is enough to make sure you pick the right one. The most commonly used one is the 4043, which is the starting point of aluminium wires. The scope of welding wires is from 4043 to 5356 as the one that tends to melt faster, thus it requires a faster wire speed and a more experienced welder. If you are just starting out, it is a good idea to get the 4043 wire alloy. Properly storing your wires will help you stay organized, but most importantly, it will protect your wires from oxidizing when exposed to different elements in the air. Always store your wires before welding aluminium and do not open your MIG wire until you’ve loaded it into the spool gun. If you do so, it can cause an uneven arc, a lot of resistance and soot which will affect the overall speed of your welding.